I fact checked Adios, America: The Left's Plan to Turn Our Country into a Third World Hellhole by Ann Coulter. Method: I randomly selected 5 chapters. For each chapter, I selected a random endnote to check. I used a random number generator. Aftewards, I personally selected 5 more issues to check. I chose issues I thought were important like the number of illegal immigrants in the US. I scored each issue up to 100% based on scholarship, not politics. Coulter's average score across 10 checks was: 87.5%. But that's just a quick overview. My main focus was on checking the details and explaining why she was right or wrong. Endnote quotes are blue, quotes from the main book are green, and other quotes are yellow. Bold in quotes was added by me for emphasis. 32. 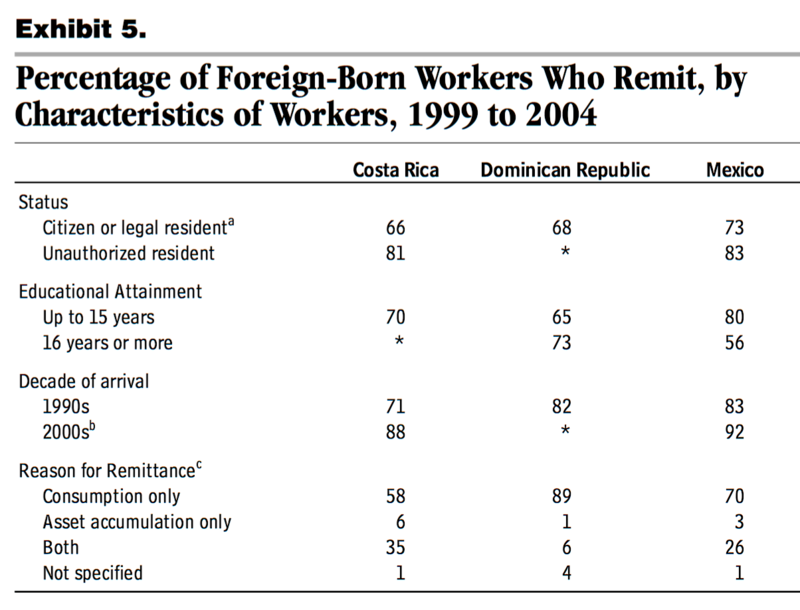 Congressional Budget Office, “Migrants’ Remittances,” 10. 33. In surveys, 70 percent of illegal immigrants from Mexico say the money they send home is used exclusively for consumption; 96 percent say it is used for both consumption and savings. Ibid. The 70% figure matches the report. This means the book text, which says "majority", is correct. 96% is the sum for either consumption only, or both consumption and savings. Coulter's wording is confusing. It sounds like she's saying 96% remit for both purposes, when actually 70% were remitting for consumption only. What she should have written, and presumably meant, is that 96% remit at least partially for consumption. Note that Coulter says "In surveys". I appreciate that accuracy. She isn't saying this is actually true, it's just a survey result. I wouldn't take off points for Coulter just writing in her style which isn't always literal. But I think this is an actual wording error in an endnote, not a style choice to entertain readers. However, there's no serious error which would mislead a reader about what's happening in world affairs. It's just a technical wording error in an endnote. It doesn't meet my ideal standards, but it doesn't really hurt the book either. 23. David North, “Lessons Learned from the Legalization Programs of the 1980s,” ILW.com, http://www.ilw.com/articles/2005,0302-north.shtm; and David S. North and Anna Mary Portz, The U.S. Alien Legalization Program (Washington, DC: TransCentury Development Associates, June 1989), 82–90. In the first place, IRCA’s objective was to offer legal status primarily to people who were in the United States at that time that they applied. There was a minor exception to that in that some 100,000 or so of the 3,000,000 applicants were allowed to file for SAW status at the southern border or at U.S. consulates in Mexico—but they had to claim that they had previously been in the United States doing a sufficient amount of farm work to qualify. Many an urban resident claimed SAW status, many without justification. There were countless anecdotes of fur-coat wearing Europeans seeking SAW status in Manhattan, applicants who contended that the cotton they harvested was purple, or that cherries were dug out of the ground, or that one used a ladder to pick strawberries. 100,000 people is a "minor exception"? And the policy was to let them file from Mexico if they simply claimed to be legit? Dumb. But Coulter said the applications were "mailed" from Mexico, whereas this talks about applying at the border or a consulate. There were some 118,000 applications filed outside the U.S., all but a handful in Mexico. The number is right. But this says "filed", not "mailed", so I think Coulter exaggerated on that point. The gist of what Coulter says in this part of the book is roughly accurate. There was a lot of fraud and the government did a bad job. But she wrote 100k and cited a book which says 29k. That's simply false. However, it doesn't mislead the reader. If she simply changed the number, her passage would be OK. 29k and 100k are both big numbers, so the general idea is correctly communicated. I really don't like errors, but it's only a technical error, so I'm giving half credit. I tweeted Coulter about this error, but received no response. I'd be happy to raise Coulter's score if she acknowledged the error and corrected it for the next edition. 15. See, e.g., William Branigin, “INS Accused of Giving In to Politics; White House Pressure Tied to Citizen Push,” Washington Post, March 4, 1997. It is not clear how many of the 180,000 immigrants whose criminal backgrounds were not checked had criminal records that would have disqualified them from being sworn in as U.S. citizens, but at least some felons have slipped through. Among them were an Ecuadoran wanted for murder and a Vietnamese immigrant who faced deportation for two felony convictions and a recent parole violation. So that's at least one murderer, and presumably more in the other 180,000 people who didn't get a background check. No doubt that's enough people with no criminal background check to include some robbers and rapists too. While murder has always disqualified an applicant no matter when it was committed, other serious crimes such as robbery or assault could make someone ineligible if they were committed within five years of the application. And to make matters worse, they weren't even trying to exclude robbers and thugs who commited their major crimes 5 years ago. The auditors also found that another 71,000 immigrants were granted citizenship despite having criminal histories on file with the FBI. Of them, about 10,800 were charged with felonies. This article, which complains several times about Republicans, is conceding everything. Since it's a hostile article – this is what Coulter's opponents are actually willing to admit to – I'm going to accept these numbers. 180k is close enough to "hundreds of thousands". It rounds up to 200k. The 70k and 10k figures are good. The murders, robbers and rapists claim is good. 28. Sarah Stuteville, “Hate Crimes Inflict Fear That May Never Fade,” Seattle (WA) Times, February 27, 2015, http://www.seattletimes.com/seattle-news/crime/hate-crimes-inflict-fear-that-may-never-fade/. I appreciate endnotes which provide the link to the material. “Hate crimes and discrimination comes from a lack of understanding and information about who these populations are, as well as a desire to target and other-ize people,” says Washington state Sen. Pramila Jayapal, who was founder of Hate Free Zone (now OneAmerica), an organization formed after 9/11 to address backlash against immigrant communities. The Seattle Times is a perfectly reasonable source for quoting what someone said. Jayapal was indeed born in India. Happily, Coulter actually links the article in a previous endnote. Six months after [Mahmud] Abouhalima arrived in New York, his tourist visa expired. Fortunately for him, Congress was preparing to authorize an amnesty program for more than 1 million illegal aliens who merely had to assert that they worked as migrant farmers. Abouhalima applied for amnesty in 1986, received temporary legal residence in 1988 and became a permanent resident two years after that. Through an attorney, Abouhalima now claims he worked for seven months on a farm in South Carolina. But his current wife told a TIME reporter that she can remember no travels outside the New York metropolitan area except for one trip to Michigan to visit friends. "The amnesty program was a joke," says Duke Austin, a spokesman at the Immigration and Naturalization Service. "Since documentation wasn't required, the burden was on the government to prove the aliens were not farmers. Fraud was widespread and enforcement virtually impossible." Time reports Mahmud's own wife told a Time reporter that Mahmud's a liar. There was no checking by the government, no need for documentation. Everything Coulter writes matches her source. Looks good to me. The latest estimate is that the United States has 11.5 million undocumented foreigners, and it's those immigrants — the illegal ones — who have galvanized Congress. That last quote is from the New York Times, from 2006 not 2005. But close enough. It does reflect that the NYT thought there were "similar" to 11 million illegals in 2005. The reason all the estimates from Pew, DHS, CIS, the Urban Institute, and the Current Population Survey are nearly identical—11 million!—is that they all use the same census data. There’s good reason to believe the census numbers are wrong. In 2005, two Bear Stearns analysts, Robert Justich and Betty Ng, warned clients that there was “significant evidence” that the census undercounted the illegal immigrant population by at least half.29 They estimated the number at closer to 20 million—and they were advising clients about something important: their money. Justich and Ng discounted the census data because it relied on illegal aliens answering surveys. 29. Robert Justich and Betty Ng, “The Underground Labor Force Is Rising to the Surface,” Bear Stearns Asset Management, January 3, 2005, http://www.steinreport.com/BearStearnsStudy.pdf. The strongest evidence supporting our theory that the actual illegal population is double the consensus estimates lies within several micro trends at the community level. We see very dramatic increases in services required in communities that have become gateways for immigration. The rate of increase in remittances far exceeds the increases in Mexicans residing in the U.S. and their wage growth. Between 1995 and 2003, the official tally of Mexicans has climbed 56%, and median weekly wage has increased by 10%. Yet total remittances jumped 199% over the same period. Even considering the declining costs of money transfers, the growth of remittances remains astounding. In New Jersey, the three gateway towns of New Brunswick, Elizabeth, and Newark exemplify this trend. According to the census, the combined population in these three towns between 1990 and 2003 grew only 5.6%, less than the 9% reported in the rest of the three corresponding counties. Yet housing permits in these three towns shot up over six-fold, while the rest of the three counties only saw a three-fold increase. More importantly, 80% of these permits were designated for multiple dwellings, so the corresponding increase in people accommodated are even greater. Official statistics state that illegal immigrants in New Jersey have jumped 110% during the same period – an estimate that is inconsistent with the housing statistics, our discussions with local realtors and the changes that we have visually observed in the demographic landscape. “To a significant degree, high rates of immigration offset the effect of a declining number of births on school enrollment.” Administrators have been surprised that school population growth significantly exceeded earlier projections, thus creating overcrowding in many school districts. Pulitzer Prize reporters Donald L. Barlett and James B. Steele recently reported for TIME magazine that “the number of illegal aliens flooding into the United States this year will total 3 million. It will be the largest wave since 2001 and roughly triple the number of immigrants that will come to the U.S. by legal means.” The TIME investigation, according to Mr. Barlett, relied not only on figures projected by the U.S. Border Patrol, but also on the reporter’s extensive investigations along the Mexican border at factories, local communities, and the district offices of the U.S. Border Patrol. YOU WILL SPEND MORE TIME TRYING TO OBTAIN BASIC CRIME STATISTICS ABOUT immigrants in America than trying to sign up for Obamacare. The facts aren’t there. In just a few decades, Minnesota has gone from being approximately 99 percent German, Dutch, Finnish, Danish, and Polish to 20 percent African immigrant,7 including at least one hundred thousand Somalis.8 And that’s not counting the Somalis who have recently left the country to fight with al Qaeda and ISIS. One hundred thousand is just an estimate. We don’t know precisely how many Somalis the federal government has brought in as “refugees” because the government won’t tell us. The public can’t be trusted with the truth. The big picture is we don't know all the numbers. Coulter's numbers make more sense than numbers she's challenging. That's good. And she doesn't overestate her case by claiming perfection with her stats. I'd say Coulter did a good job here. She presented the reader with useful information and put it in context in reasonable way. She challenged some claims that deserved challenging and gave some alternatives to consider that are more reasonable. They're imperfect, but the main point is people should stop accepting the 11 million figure and reconsider. Coulter's right about that. A quarter of Mexico's population? America has already taken in more than one-quarter of Mexico’s entire population, according to the Pew Research Center’s analysis of census data.9 The United States has more Hispanics than any other country besides Mexico.10 Do we have to admit all 120 million Mexicans to prove to the New York Times that we’re not “nativist”? The Pew Research Center page linked does give the 33.5 million figure exactly as quoted. The population of mexico is around 120 million. One problem is if we took in 33.5 million Mexicans, and there's 120 million in Mexico, then that's 153.5 million total, of which we have closer to a fifth (21.8%), not a quarter. I think Coulter's point was to put 33.5 million Mexicans in context. It's over a quarter of the current population of Mexico! That's a lot! I read her comment more as a stylistic choice than strictly about math. And I don't think rounding 21.8% to 25% is very bad, it's in the right ballpark. In reality, the immigration data from Pew is not nearly as neat and tidy as Coulter concludes. The Pew report attempted to count the number of people who trace their roots back to Mexico, not people who came directly from that country. Why does that make such a difference? Well, about two-thirds of Americans with Mexican ancestry were born in the United States. By definition, they were never part of Mexico’s population. If they weren’t Mexican, they could not be "taken in." The Pew definition is important, and if the numbers about Mexico don’t make it clear, let’s look at another country. We picked Ireland. In 2014, the Census Bureau said there were 34.1 million Americans with Irish roots. That’s nearly seven times Ireland’s current population. An estimated 33.5 million Hispanics of Mexican origin resided in the United States in 2011, according to the Census Bureau’s American Community Survey. Mexicans in this statistical profile are people who self-identified as Hispanics of Mexican origin; this means either they themselves are Mexican immigrants or they trace their family ancestry to Mexico. They were not looking for, or counting, anyone with any Mexican ancestry or roots like Politifact claims. They were only counting people who self-identified as "Hispanics of Mexican origin". Politifact is contradicting Pew's own statement about their data (hoping no one will notice) in order to try to make Coulter look bad. Did Coulter use loose language and exaggerate here? Yes. (Was what Politifact said worse? Yes!) But so what? You're allowed to talk loosely at times. The one quarter comment was putting things in perspective, not trying to be a rigorous analysis. There's plenty of other material in Adios America which is more rigorous and factual, and is worded to indicate that. I would like if Coulter was a little more careful at times, but I don't see any significant problem here. I don't think it would mislead a reader in general. There's a big problem and Coulter's saying there's a big problem, which is true. Do Illegals Honestly Answer Government Surveys? Justich and Ng discounted the census data because it relied on illegal aliens answering surveys. As Justich told the Wall Street Journal, “The assumption that illegal people will fill out a census form is the most ridiculous concept I have ever heard of.”30 People who have left their families, paid huge sums of money to smugglers, trekked thousands of miles, and broken American law to enter this country don’t have much incentive to fill out questionnaires from the U.S. government. The census tried to account for the reluctance of illegal aliens to answer government surveys by adding 10 percent to their population estimate. Guess where they got 10 percent? From another survey of illegals. In a recent report, the center wrote "It is well established that illegal aliens do respond to government surveys such as the decennial census and the Current Population Survey." And does endnote 50 have an argument that illegals respond to government surveys? No. That endnote is on the topic of estimating things about the people who did fill out surveys, not on the topic of how they "established" that illegals are filling out surveys in the first place. The Center for Immigration Studies, a group that favors reduced immigration much as Coulter does, disagrees with that last point. It's not that the Center for Immigration Studies had a good argument. Or any argument at all. Nor does Politifact have an argument. Instead, it's that the Center for Immigration Studies is asserted by Poltifact to be anti-immigration, and their point is basically "even the people who don't like immigration know Coulter is wrong". That's such an unscholarly approach that I wanted to point it out. For the issue of Politifact attacking Coulter's argument that illegals don't fill out governement surveys, I'd say Politifact did a lot worse than just remaining silent. It showed their own flaws, not any mistake by Coulter. How Dumb Is The Government? That last claim Coulter made sounded interesting to me. Did the government really use a survey of illegals to try to find out whether (and at what rate) they answer surveys? Let's find out. 30. Carl Bialik, “In Counting Illegal Immigrants, Certain Assumptions Apply,” Wall Street Journal, May 7, 2010, http://www.wsj.com/articles/SB10001424052748704370704575228432695989918. Researchers at CIS and Pew and in the federal government use a decades-old technique that looks at the number of foreign-born people in the U.S., as counted by annual census surveys. Then they subtract the number of foreign-born people in the U.S. legally, based on immigration records and projections of deaths and outmigration. The remainder is believed to be the number of illegal immigrants. There are several assumptions that underlie these estimates, including the figures for outmigration, which isn't tracked by the U.S. government. The biggest problem, though, is that no one really knows what proportion of illegal immigrants respond to census interviewers and how honest they are about their place of birth. These studies presume that about 10% of illegal immigrants aren't counted by census takers. But that figure largely is based on a 2001 University of California-funded survey of 829 people born in Mexico and living in Los Angeles, in which individuals were asked, among other things, whether they responded to census interviewers a year earlier. Representatives of nearly two in five households refused to answer that survey, and those who didn't might have been more likely to skip the census count as well. But it's just a WSJ article with no cites or links. This is the internet! Why not link to the surveys you're talking about? :( He didn't even give the name of the study, the journal, or anyone involved with it, which makes it hard to search for. Even if I find the 2001 study and everything checks out, how would I know that the other unspecified studies presuming the 10% figuring were basing it largely on the 2001 study? To figure this out properly would require a bunch of work. Coulter or Bialik should have done this work and shared it, but they haven't. Coulter, unfortunately, seems to have just dumped responsibility on Bialik's article which makes some big claims without giving the details. The Census Bureau’s counting process for the migrant population has some shortcomings. According to our discussions with illegal immigrants, they avoid responding to census questionnaires. For this reason, the official estimates do not fully capture this group. According to Maxine Margolis, author of An Invisible Minority: Brazilians in New York City, the discrepancies started well over a decade ago. The 1990 census, for example, recorded only 9,200 Brazilians in New York City, while the local Brazilian consulate estimated 100,000 Brazilians at that time. The Brazilian foreign office placed the number at 230,000; Dr. Margolis also noted that comparisons of the Boston Archdiocese and Brazilian consulate records with U.S. census records show a startling 10 to 1 difference. I didn't find a paper on the 2001 survey itself, but I found Immigrant Voting in Home Country Elections which has detailed information about it. The July 2001 Los Angeles County Mexican Immigrant Legal Status Survey (LA-MILSS) is a random sample of 456 households in which at least one person was born in Mexico and 829 foreign-born Mexicans who resided in Los Angeles County in July 2001. Looks like the survey happened in the right place with the right number of people. household response rate of the LA-MILSS is 62 percent. Slightly less than half (46 percent) of adult respondents admitted to residing in the United States without being a naturalized citizen, a legal permanent resident or a temporary visitor. Guess what the footnote is. Think it'll provide details of the 10% undercount? Or maybe it'll give their calculations for the 1.8-3.1 million range? No, all it does is say the government used the 10% number. 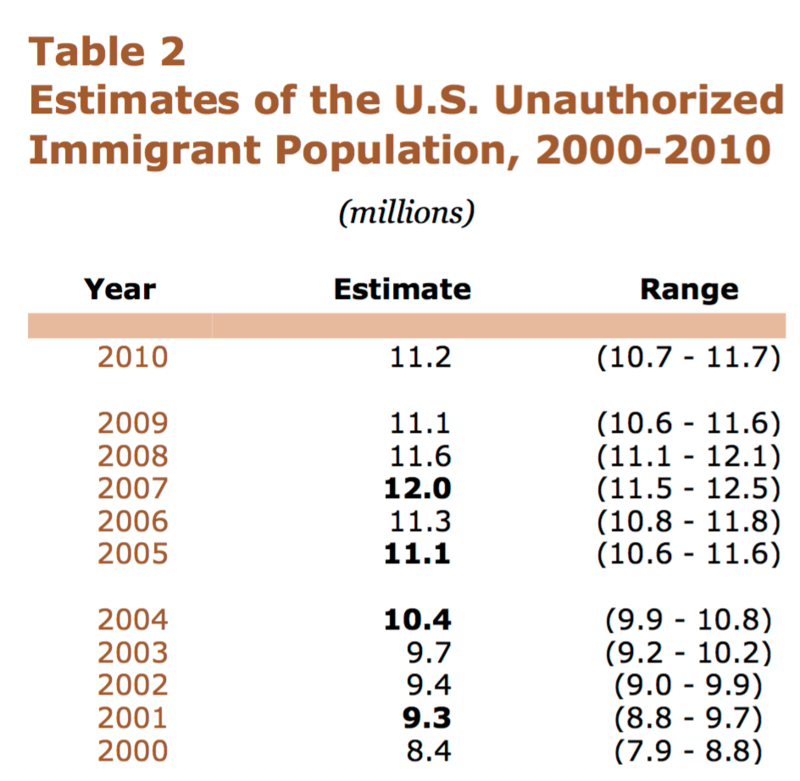 15 This estimated undercount rate was employed in the recent U.S. INS report on unauthorized immigration in the United States (U.S. Immigration and Naturalization Service 2003). That's not useful. Although it does provide an example of the 10% figure being used, like the WSJ article claimed. This paper employs the 2001 Los Angeles Mexican Immigrant Legal Status Survey (LA-MILSS) data to estimate the contribution of unauthorized and Legal Mexican immigrants to the Census undercount in Los Angeles County. After estimating the number of Mexican immigrants by legal status and whether each individual was enumerated in the 2000 Census, we examine various sources of omission. Logistic regression results suggest that individual demographic characteristics, social network quality, and neighborhood characteristics help explain variation in whether a person was counted. And that's all the information we get. This makes it hardre to blame Bialik and Coulter for not providing more cites. These guys just publish a paragraph summary online and don't bother publishing their actual details. They share their ideas in person, apparently to be cited by other people who took notes while they were talking, I guess. Note the 850,000 adjustment the INS used is 6.7%, not 10%, even though their footnote says 10%. OK now let's step back. Coulter said they asked people if they answered the census, and 10% said no. But I wasn't able to find that question from the survey and the results for it. Coulter's own citation should have led me to find that, since she makes that claim in her book. That's bad. On the other hand, she's right about the big picture: the government and others are pretty much just making stuff up instead of being scholars with facts. The quality of the work Coulter's questioning is ridiculously low. She's right to draw attention to it. The theme of her book holds up. So again I'm going to deduct some points for a technical problem (I couldn't find some of the specifics she brought up her endnotes, even after doing quite a bit of research), but Coulter hasn't said anything that would mislead a reader about the state of the world. She isn't playing loose with facts to trick anyone about anything. So, will illegal immigration destroy the country? Would amnesty mean Republicans never get elected again? Are these third-worlders assimilating, or not? Are we in danger? Is this a serious enough issue to really threaten our country? Could it be Adios America!? 22. William Booth, “One Nation, Indivisible: Is It History?,” Washington Post, February 22, 1998, http://www.washingtonpost.com/wp-srv/national/longterm/meltingpot/melt0222.htm. One study of the children of immigrants, conducted six years ago among young Haitians, Cubans, West Indians, Mexican and Vietnamese in South Florida and Southern California, suggests the parents are not alone in their concerns. Asked by researchers Alejandro Portes and Ruben Rumbauthow how they identified themselves, most chose categories of hyphenated Americans. Few choose "American" as their identity. Then there was this – asked if they believe the United States in the best country in the world, most of the youngsters answered: no. Like Coulter said. But where's the details? They were harder to find because Ruben Rumbaut's name is mispelled :( I did find some paywalled stuff, but since I don't even know which one they are talking about, I didn't buy it. 19.Ruy Teixeira, “The Emerging Democratic Majority Turns 10,” Atlantic, November 10, 2012, http://www.theatlantic.com/politics/archive/2012/11/the-emerging-democratic-majority-turns-10/265005/. Voters in 2012 were 28 percent minority, an increase of 2 percentage points from the 2008 level and a massive 13 percentage point increased from the 1988 level of 15 percent. Minority voters backed Obama 80 percent to 18 percent in 2008 -- and did exactly the same for the president this year. His support among African-Americans was almost as overwhelming (93-6) as it was in 2008 (95-4). And his support among Hispanics (71-27) improved substantially over its 2008 level (67-31). In addition, Obama achieved historic levels of support among Asian-Americans. This year he carried them 73-26, compared to 62-35 in 2008. Everyone seems to agree that it is Minnesotans’ responsibility to assimilate to Somali culture, not the other way around.11 The Catholic University of St. Thomas has installed Islamic prayer rooms and footbaths in order to demonstrate, according to Dean of Students Karen Lange, that the school is “diverse.” Minneapolis’s mayor, Betsy Hodges, has shown up wearing a full hijab to meetings with Somalis. (In fairness, it was “Forbid Your Daughter to Work Outside the Home” Day.) A suburban Minnesota high school has “Welcome” signs written in Somali, a Somali student group, and articles in the school newspaper about how unhappy the Somalis are. The arc of history has truly bent toward diversity and inclusivity in both Minneapolis and St. Paul. Whether history’s arc can also bend more nearly toward justice and opportunity for nonwhite, nonaffluent residents is an unanswered question. Making it so may be the greatest challenge these cities face if they are to remain prosperous in the 21st century. “If we do it right, we will begin to weave our city and our neighborhoods together fully, not merely in our conversations, but in our hearts and in our minds, as well. [...]” Hodges said. Changing people’s thinking about the value of every part of the city is essential to closing the income gap, achievement gap, health gap and all the other income- and race-based disparities that afflict the Twin Cities. It will take vigorous use of the mayoral bully pulpit to spur that change. At that task, Coleman and Hodges have begun well. The focus here is on Americans doing something, changing their thinking, looking at the world differently, etc, rather than on saying to the immigrants, "Hey guys, you came here. If you want to make more money and be more educated, then you change. Start acting like Americans and you'll get the same results we do without our city changing anything." With immigrants not being assimilated and voting heavily for the Democrats, America is at genuine risk. But I wasn't satisfied with the details of the second generation immigrant cite. Again I'm not questioning the book's main themes, but I would have liked better research behind Coulter's factual details. Coulter's average score is 87.5%. But you should try to understand what Adios America is like, not rely on a summary number. Please judge for yourself. Despite all the endnotes, this doesn't appear to be a book of extremely careful fact checking and research. Coulter sometimes relies on sources like newspaper articles and repeats their claims without further checking. She makes some technical errors. But I didn't find a single instance where the message of her book was mistaken, which is what I'd say matters the most. If you liked this, check out my previous Ann Coulter fact check, and my review of her critics' scholarship. Thank you Justin Mallone for help finding some of the information. >For each chapter, I selected a random endnote to check. I used a random number generator. >Despite all the endnotes, this doesn't appear to be a book of extremely careful fact checking and research. In fairness she's very politically capable and understands very well what issues a typical US right wing voter cares about - much better it seems than a typical Republican politician. "First nationalist/isolationists whose tenets seem to be that 1) America is God’s chosen nation and 2) the rest of the world can go to Hell. This is dubious theology at best, and the fact that America won’t be in good shape for long if the rest of the world is in flames should be obvious. The Cruz-Trump line that the United States can prosper while hiding between two oceans and occasionally carpet-bombing a far-off land is preposterous as well as morally repugnant." I could go on but she's an interesting person but in no way resembles your love-struck description as an "amazing scholar". > The Cruz-Trump line that the United States can prosper while hiding between two oceans and occasionally carpet-bombing a far-off land is preposterous as well as morally repugnant. Also what's so humorous about a random number generator? What's the joke? Also, are you a values-hating nihilist? I ask cuz you seem kinda happy over your incorrect interpretation of "And so curi's enchantment with Ann Coulter ends"